CT5200-1 is a Cobalt Molybdenum Chromium superalloy which provides excellent wear resistance, corrosion resistance, high temperature resistance and oxidation resistance up to 1400° F. CT5200-1 is applied using the air plasma spray process to achieve dense coatings that contain hard laves phases. These hard laves phases provide wear resistance without the excessive wear on mating components that is often associated with tungsten carbide or chromium carbide type wear resistant coatings. CT5200-1 is often used where lubrication is low or nonexistent. 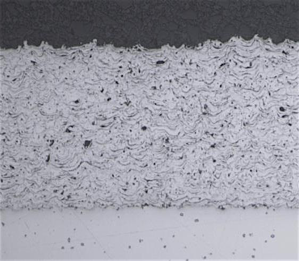 This coating wears very well against itself and against stainless steel, aluminum and other superalloys. CT5200-1 may be heat treated for improved wear resistance and improved density for critical corrosion applications. CT5200-1 may be used in oxidizing or reducing atmospheres and in non-oxidizing environments. CT5200-1 is widely used in aerospace and industrial applications where a combination of high temperature resistance and wear resistance are desired. It is an excellent material for use in one side of a bearing match – wearing well against most metals used in hot oxidation or hot corrosion applications. It is also frequently used in ambient temperature applications where superior wear resistance is required and where galling needs to be overcome. CT5200-1 may be finished by wet grinding with silicon carbide wheels. The coating may also be lapped or superfinished.